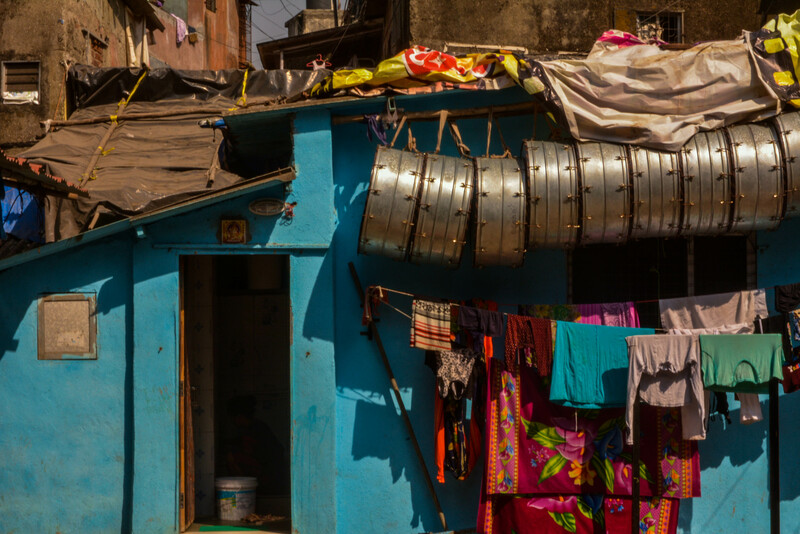 Walking along the bustling Dharavi main road, it is difficult to believe that behind the busy shopfronts lies a quaint Koli settlement; hyper Dharavi’s very own fishing village. 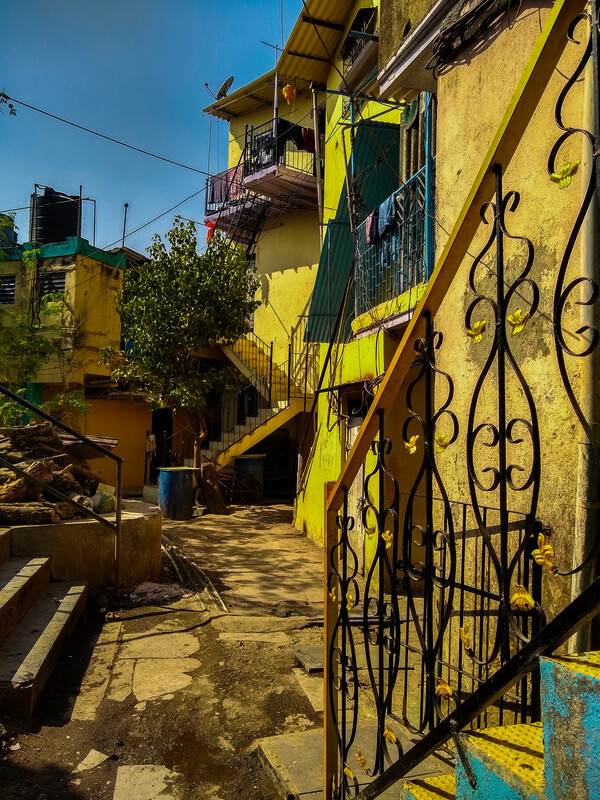 As soon as you enter into one of the many gullies leading into this settlement, the sonic chaos subsides and is replaced by a visual frenzy which makes you wonder if you are still in Mumbai. 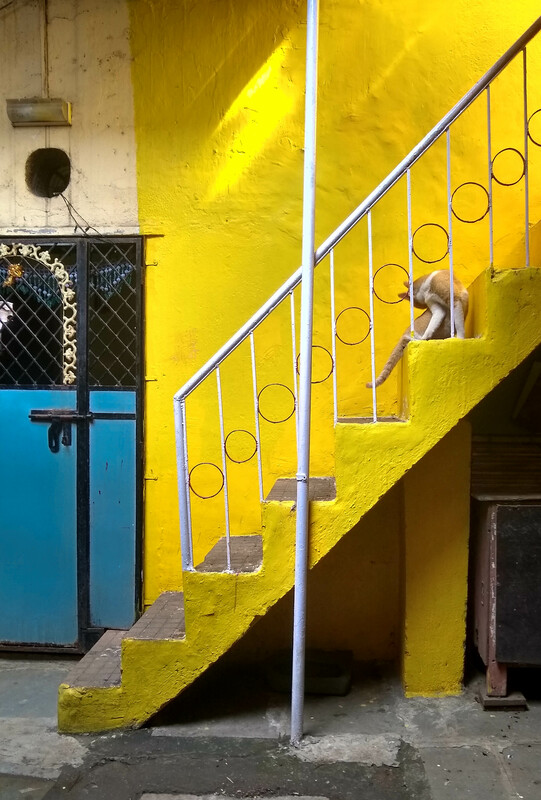 Koliwada Dharavi dazzles with its wide-ranging colour spectrum. 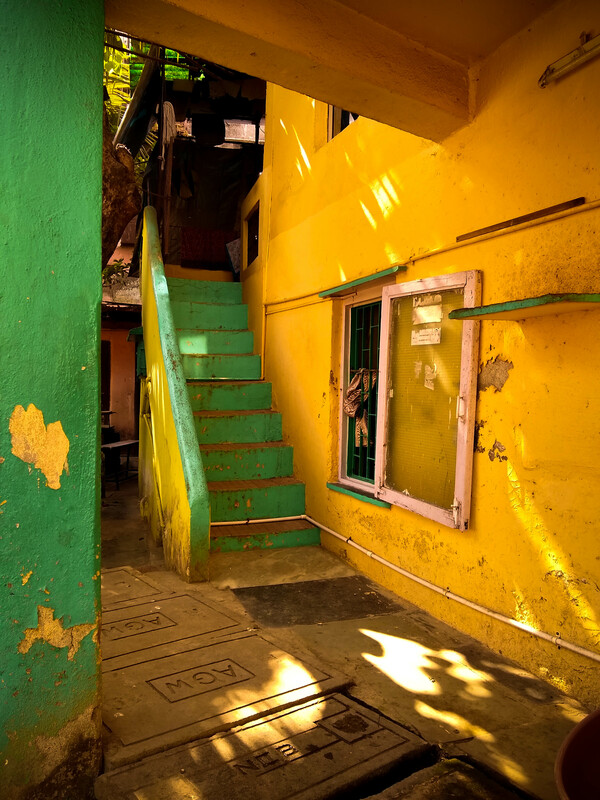 Each house, be it a hut, a chawl or a duplex, has its own ‘statement walls’, proudly painted by the homeowners in the most vibrant hues. The street facades are loud and bright. The ground floor tenements spill onto outlying plinths called otlas, that are used as wet areas, storage or seating, all depending on the time of the day. 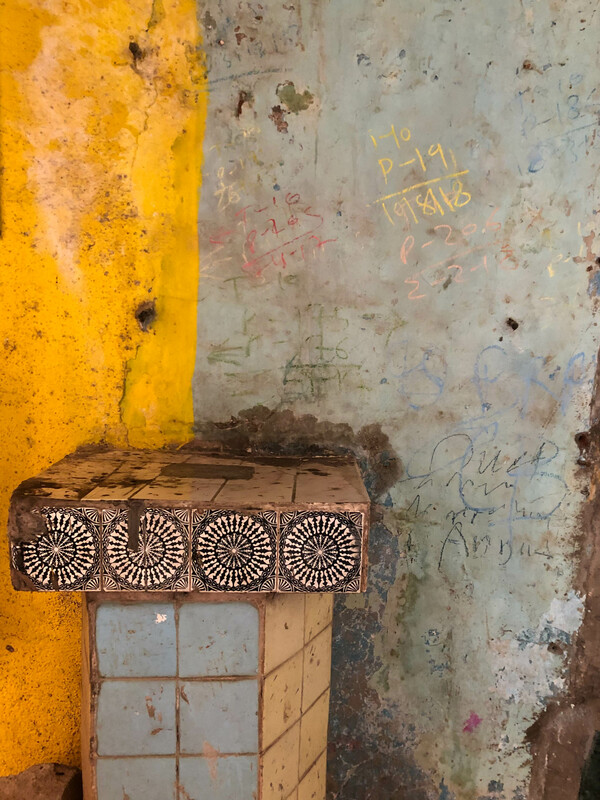 These otlas are key nodes for communal interaction and one is very likely to find Koliwada’s high-spirited residents on these plinths, both- humans and animals. 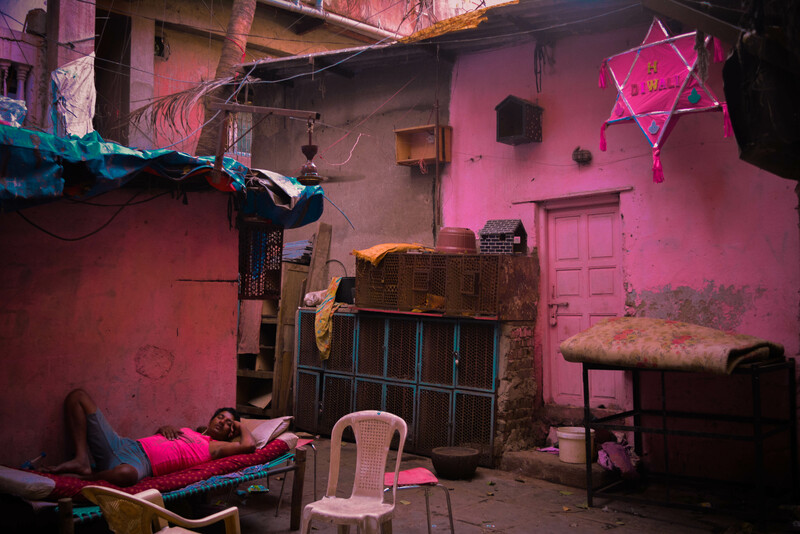 If you are walking in the morning there is a probability that you meet locals, but as the day progresses past noon, people retreat into their houses for afternoon siestas. The village that was bustling with energy some time ago, withdraws into its cocoon, leaving behind a tranquil stillness. Even the animals appear to have received a memo, retiring in the shadows for a nap. The buzz dies down and you are left alone to explore the anatomy of this urban village. Once the silence prevails, one starts to scrutinise the surroundings much more deeply, probing into details and patterns that emerge from them. The once seemingly irregular arrangement of objects starts to make sense. Each house is atypical, and thoughtfully decorated, the openings are painted in different colours than the house. 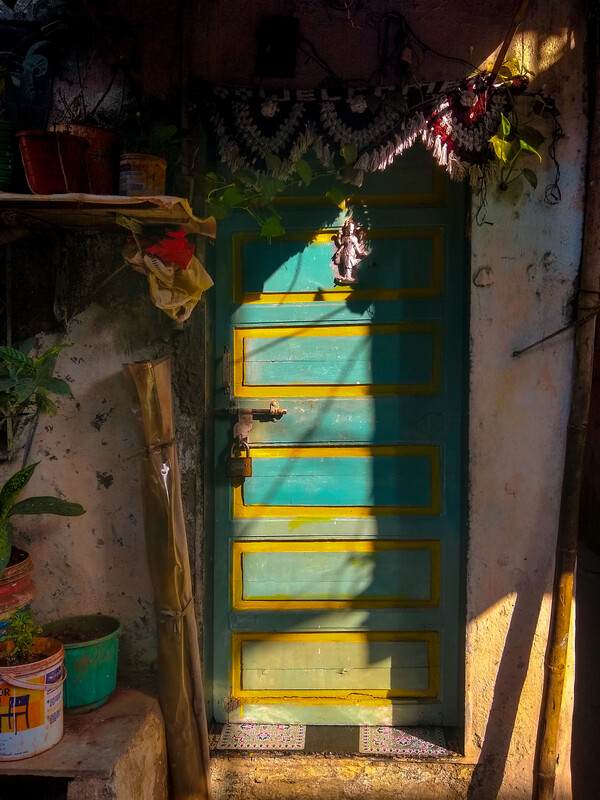 The doorways are adorned with hand-woven torans and are often left open. As a result of the closely packed nature of the settlement, it is rare to find houses with more that one window, leaving them to rely on an exhaust vent, which is usually disguised smoothly. There is an order in the organisation, a very efficient apportion of space for both storage or ornamentation. The rangoli patterns on the floor are strategically rendered to avoid any hindrance to one’s movement through the gullies. 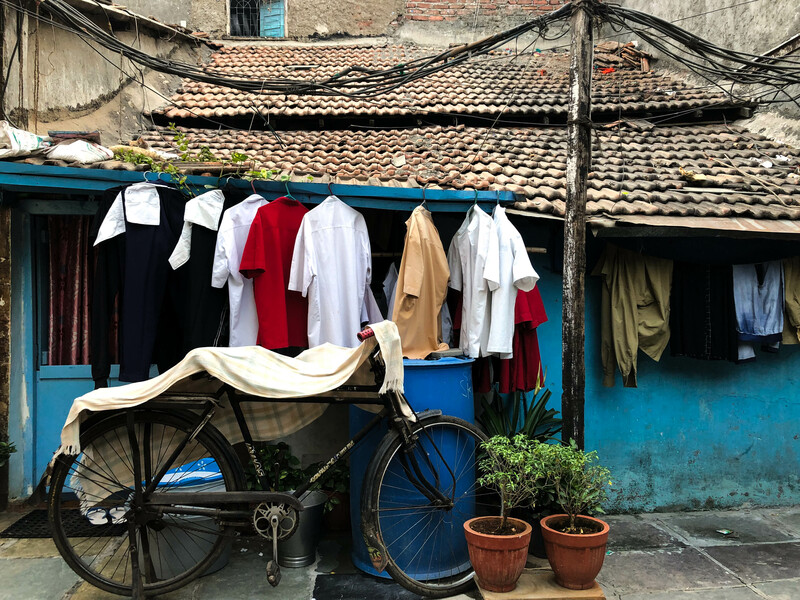 The clothesline is strung right outside the window, so when clothes are hung, they act as curtains as well as aid in cooling the house during the day. One of the bigger courtyard/chowk shared by the houses has a house where you can observe an unconventional fashion of storing drums. Much like the clothes under them, the drums are strung together outside the house until it is time for them to be put to use for a local wedding or the annual Ganesha festival. Another quite peculiar use for outdoor space is the courtyard being transformed into a living room, with a ceiling fan installed outside with a man napping on a bed under it, chairs placed facing one another, the space starts to replicate a living room inside a house very intuitively. 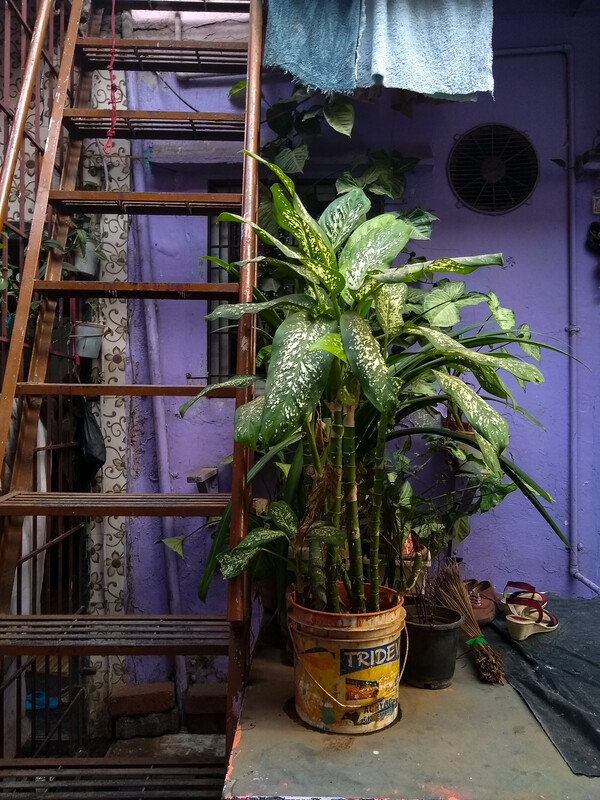 Elements like the railings of staircases and grills of windows are not merely used as utilitarian entities but also, as an expression of aesthetic, each varying from corner to corner yet coming together as part of one neighbourhood harmoniously. Even something as commonplace as textiles are quaintly patterned with flowers and shapes, adding more texture to the visual fabric in front of you. 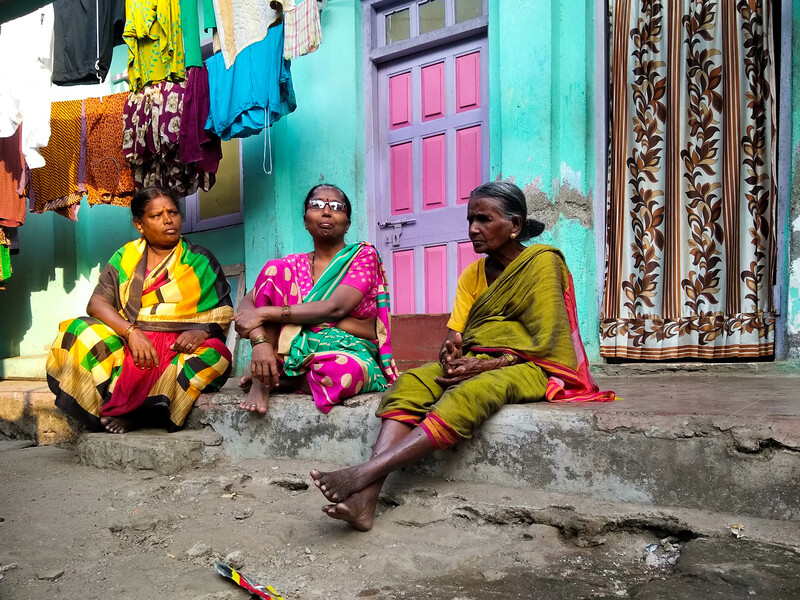 All in all, the Koliwada may come off as a kitschy village or one with a rich vernacular legacy that is forever adapting to the high voltage settlement that it is attached to. Perhaps it is a bit of both!